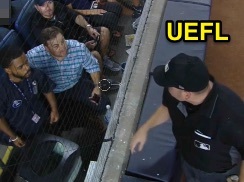 HP Umpire Dan Bellino ordered removal of a fan ("unofficial ejection") in New York for shouting pitch location information while the Yankees were at bat during Tuesday night's Rays-Yankees game. Bellino speaks with Yankee Stadium staff. With two out and two on (R1, R3) in the bottom of the 8th inning, Yankees batter Gary Sanchez worked his way to a 2-1 count against Rays pitcher Austin Pruitt. After Sanchez swung and missed at a low-and-away slider, Rays catcher Wilson Ramos' conversation with Bellino became fairly noticeable. Immediately after the 2-2 pitch was thrown in the dirt, Bellino called "Time," replaced the ball, and walked to the screen behind home plate, summoning Yankees security and guest services personnel before returning to the field to confer with Crew Chief Jerry Layne. After the game, both Joe Girardi and Kevin Cash confirmed that Bellino had indeed ordered a fan removed—or at least silenced—after a voice from the stands had been calling out pitch locations during Sanchez's at bat. In 2016, Bob Davidson ordered an apparently inebriated fan removed in Philadelphia for shouting vulgarities. Said Davidson postgame, "I turned around and said, 'You know what, get rid of this guy. '...People cheered me, which is unusual in this town for me." Davidson's fan removal request ultimately won him a UEFL Ejection of the Year award. Related Post: Unofficial Ejection - Bob Davidson Requests Fan Removal (8/2/16). In 2014, Tim Welke ordered a fan removed in Atlanta for heckling Bryce Harper. Related Post: Fan Ejection: Tim Welke Calls for Removal of Harper Heckler (9/16/14). Official Baseball Rule 8.01(b) authorizes an umpire to "order a player, coach, manager, or club officer or employee to do or refrain from doing anything which affects the administering of these rules, and to enforce the prescribed penalties." By order Yankee Stadium staff to remove the offending spectator, Bellino had invoked his OBR 8.01(b) power.